Although the clinical manifestation of acne is quite simple and is seen as pimples on the surface of the skin, acne is actually a complex disease. What drives the formation of pimples is complicated and can be attributed to a number of things. For instance, women with over-productive adrenal glands can experience elevated levels of testosterone, an androgen, in their blood, which causes their acne. For some, a large growth spurt with very high levels of fluctuating hormones during adolescence may cause their acne and for others it is linked to their menstrual cycle. For men, it may be a result of high testosterone, but increased levels of estrogen and other hormones may also be the culprit. Genetic variation is also a contributing factor, and if one’s parents had acne it is likely that their children may also. Finally, even lifestyle habits such as diet or skincare, may not directly cause acne but can exacerbate the existing condition. For all of the above scenarios, the common denominator is the overproduction of sebum by the sebaceous glands. This can lead to clogged pores where dead skin cells accumulate, providing an ideal environment for the growth of bacteria. The cascade begins with the over-secretion of sebum (skin oil) by the sebaceous glands, which manifests itself in oily skin, and oily hair as well. This is the first stage of acne. If you want to prevent more serious breakouts, it’s important to start your acne treatment at this early stage. Pores in the skin become clogged with excess sebum and dead skin cells, which appear as whiteheads and blackheads. This is already acne in progress and the clock is ticking to begin treatment. An additional problem at this stage is the dangerous myth that by squeezing out blackheads and whiteheads you get rid of the problem. Please be aware that although occasional professional extraction may be done, it is not always successful. Popping the whiteheads and blackheads, whether professionally or by yourself, may lead to infection and skin damage which may result in scars, marks, and even more prominent pimples and cysts. The body sends in white blood cells (inflammatory cells) to kill the bacteria. Please note that at this time the cascade is in a full swing and those pimples will come to the surface no matter what you do. The only course of action at this point is to try to make the symptoms a little milder and PREVENT new acne from forming, which is what AcnEase® does. The formation of pustules and papules with redness surrounding the pimples appear on the skin’s surface. Inflammation spreads outside the pore to surrounding tissue to form cysts, the most severe form of acne. When considering treatment options, it is important to understand which stage of the acne cascade will be impacted. Certain products such as systemic antibiotics (tetracycline and minocycline) or topical antibiotics will interfere with Step 3, which is the growth of bacteria trapped in the pores. Benzoyl peroxide (BP) also provides antibacterial action; therefore it also affects Step 3 in the acne cascade. BP should be used with caution. According to a recent FDA warning, there have been concerns surrounding the potential connection between BP, sun exposure and skin cancer. BP can also cause serious irritation if used too often, and if used on sensitive skin. Retinoic acid based products such as adapalene may help unclog pores, and salicylic acid can reduce the number of dead skin cells in the pores, therefore both products tend to target Step 2 in the acne cascade. These topical products are considered more effective for treating comedones (whiteheads and blackheads.) Unfortunately, both of these have been linked with irritation as well, including possible allergic reactions, aging of the skin, and other dermatological side effects such as skin discolorations or damage. These chemical treatments are NOT recommended for teens due to the possibility of severe side effects, affecting the functioning of the liver and/or the nervous system. These agents may seriously discolor the skin if you have dark skin. NONE of the above products truly address the cause of acne, step 1, in the acne cascade. Additionally, regardless of where you are in the acne cascade, AcnEase® can appropriately step in with enough time to prevent future reoccurances and also eliminate the current symptoms. AcnEase® is unique in that it is the ONLY non-prescription treatment that interferes with the first step in the acne cascade, the overproduction of sebum. Therefore, AcnEase® is the ONLY over-the-counter agent which PREVENTS acne from forming. Is your acne mild, moderate or severe? Are you pre-adolescent, teenage or adult? All of these factors, in addition to your own genetic makeup, will contribute to how you select your acne treatment. 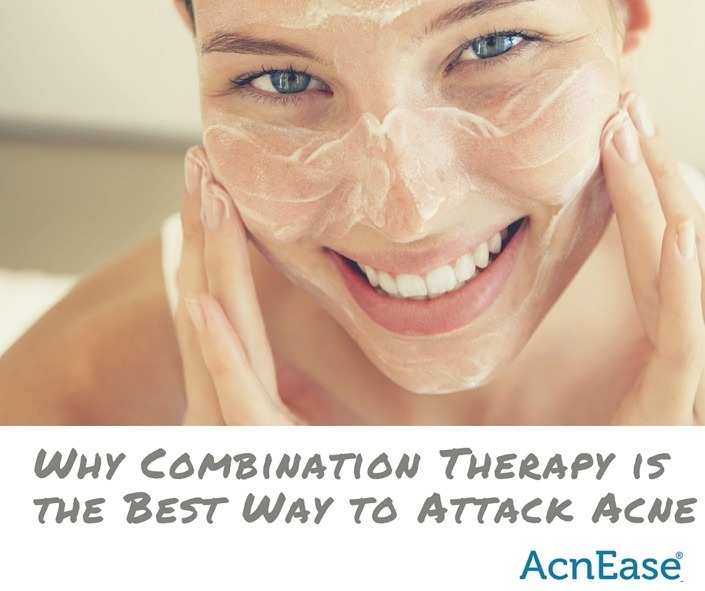 Given the overall complexity of acne, it is not surprising that it is often useful to consider combination therapy to obtain your desired results. Combination therapy occurs when two or more therapies are used to treat the same condition. Since AcnEase® is the only product which prevents new pimples from forming, it should be strongly considered as a member of every combination therapy regimen. The use of topical agents can prevent bacterial growth, unclog pores, and treat existing acne. However, they do little to prevent new pimples from forming. Adding topical acne agents to your AcnEase® regimen can help treat existing acne by unclogging pores or preventing bacterial growth in clogged pores, which can limit inflammation and subsequent skin damage. It is important to select topical agents, which may help your current condition - just also consider the potential side effects. There are many options for those who are looking for a gentle, chemical-free solution to treat the suface of the skin. Any of the following natural topical options are suitable to pair with AcnEase’s® systemic treatment. Chamomile astringent. Chamomile has been known for its healing properties since ancient times. A naturally calming herb, chamomile is rich with anti-bacterial and anti-inflammatory properties. Chamomile can provide wonderful results for the skin, whether taken orally or used topically. To create an at-home chamomile astringent, brew 3-4 chamomile tea bags in 1 cup of water to make a strong tea. Once cool, soak a cotton ball in the liquid and apply to the skin. You can also add a dash of apple cider vinegar for a double-dose of bacteria fighting ingredients! Naturally exfoliating papaya mask. The creamy pulp of papaya contains many transformative properties that benefit the texture and appearance of the skin. Papain, a protein-digesting enzyme found in the fruit, works to shed the top layer of dead skin cells, revealing a brightened, even tone, while simultaneously deep cleaning the skin. To create an exfoliating mask, mash ½ papaya and mix with one whipped egg white and 1 teaspoon of organic honey. Combine all ingredients until smooth and apply to the skin. Leave mixture on for 10-15 minutes, rinse with warm water, followed by a splash of cold. If the mixture begins to tingles, that is a naturally occurring effect of the papaya. However, if you feel a burning sensation or any discomfort, remove the mixture immediately and cleanse your skin. Pore Closing Yeast Mask. Combining the antibacterial properties of brewer’s yeast with lemon juice will offer the skin a thorough cleanse, purging pores of dirt and bacteria. Mix 1 tablespoon of yeast with 1 tablespoon of lemon juice. Apply to the face and rinse after 20 minutes. If you have sensitive skin or very severe acne (open breakouts), you may want to stay away from lemon juice! Pore Cleansing Herbal Steam Bath. Clogged pores lead to acne and the combination of excess sebum with dead skin cells contribute to breakouts. The combination therapy of treating your skin from the inside and the outside is the best way to keep pores clean and skin acne-free. Steaming the face will open pores, making it easier for skin to release dirt, oil and toxins. The heat will stimulate your blood flow, leaving you with a healthy glow. Add 4 cups of water to a pot, add a handful of mint (anti-bacterial), a handful of parsley (rich in vitamin C,) and the juice of half a lemon (cuts through oil). Heat the bath to a steam, then remove from the stove and place on a steady surface. Throw a towel over your head and let the steam bath work its magic for 10 minutes. When considering your acne type and the current stage of the acne cascade, a combination treatment should include AcnEase® since it can stop acne at the first stage in the cascade. This is the only solution that will treat your acne from the inside, working to stop the acne cascade at its onset. While determining the right course of action to combine with AcnEase®, consider the stage of the acne cascade that you are in and be mindful of potential irritation and side effects that may occur from various products. AcnEase® has no side effects and is safe to take by everyone regardless of acne type, age or gender.